With thanks to Brenda Whitaker (nee Grime) for the scan and comments. Thanks also to Freda Bates, Howard Barrett and his wife Christine (nee Hardaker) for additional names. 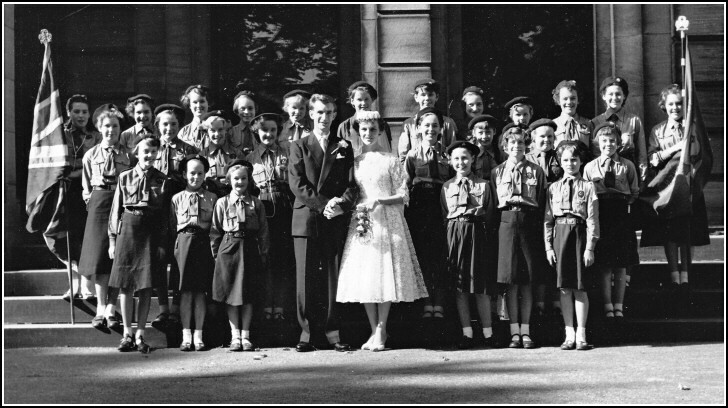 The Guides in Sutton, the oldest company in the district, paraded in many of the local Gala Days and attended special services at both St Thomas' Church and the Baptist Church. Sutton Girl Guides met weekly at the Baptist Sunday School rooms and then later took over what used to be the Scout Hut to the left rear of the Sunday school. I was Guide Captain for a few years and it was during this time that they formed a Guard of Honour at my wedding. As captain I represented the company and was presented to the Princess Royal on the 50th anniversary of the formation of the Girl Guides, the District Commissioner at the time was also Guide Captain of Steeton Girl Guides, Miss Dorothy Clough � she lived at Steeton Hall and the Steeton Guides met there. It was to her chagrin that Sutton was the oldest company by just a few weeks. Third row: ? ?, Francis Wellock, Jean French, Ann Conyers , Elizabeth Chadwick, Pauline French, Vivien Willis , Bridget Stinson, Heather Smith, ? ?, Sylvia Feather, Jean Thompson. Second row: Freda Barrett, Pat Hisco, Jean Smith, Lorraine Watson, Christine Thompson, Auriel Hargreaves, Alison French, Evelyn Markham (deceased). Front row: Eileen Holt, Janet Hodgson, Jean Thackray, Christine Spencer, Mary Person, Christine Hodgson.